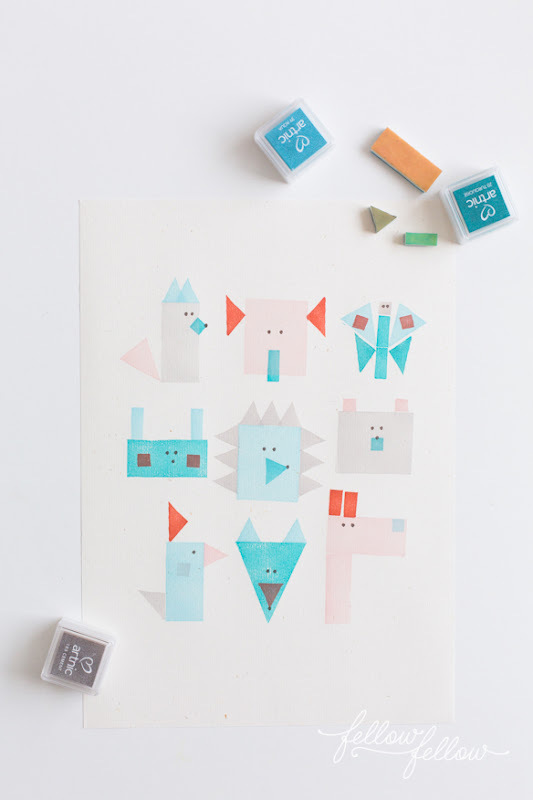 The minimal, geometric designs that Fellow Fellow is sharing lately make me happy. Reducing objects to their most basic shapes is very satisfying, and these are great examples of what you can do with rectangles and triangles. 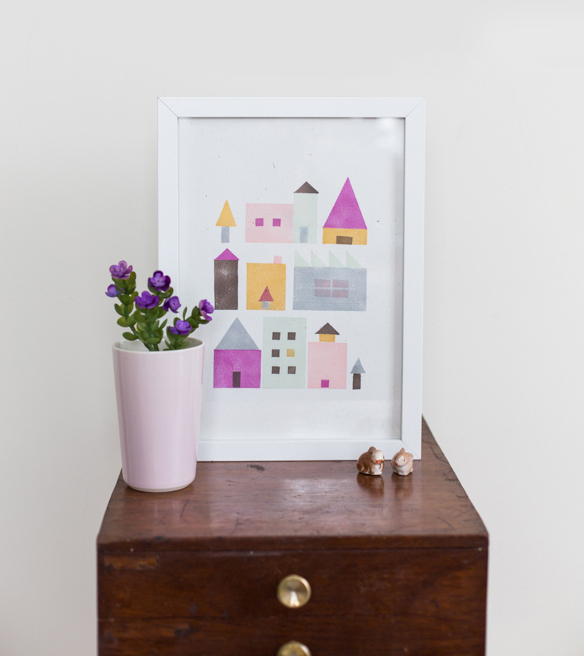 Head to Fellow Fellow to see how to make your own stamps and create a village print. Or grab the kids and stamp some animals together. Abstract patterns are pretty, too, when they've got that nice, stampy texture. Lovely work, Claire! I would have never come up with that, but I love the animal stamping! Anyone know a way to make similar stamps without plastic (other than potatoes...)? Maybe lino, but is that much harder to cut, and does it ink as well? Awesome ideas! Love the little streetscapes. Fabulous ! I simply love them ! This is so awesome, I have ti try it! Simsim - but what is craft foam made of? It must be some kind of synthetic material, right? I'm looking for something that will biodegrade safely instead of becoming pollution. Guess potatoes might be the way to go after all. Nina, yep. I think you're left with potatoes. You can use anything you don't mind getting ink on and discarding like fruit and vegetables (use the end cuts that you don't eat), walnut shells, acorn caps, pebbles, rocks, crosscuts of corrugated cardboard, and natural sponges are just some examples. Good for you on avoiding synthetics. I recognize all the animals except the blue rectangle with the suspenders. Lol. Thanks for the great idea, can't wait to try it. This is such a fabulous idea! 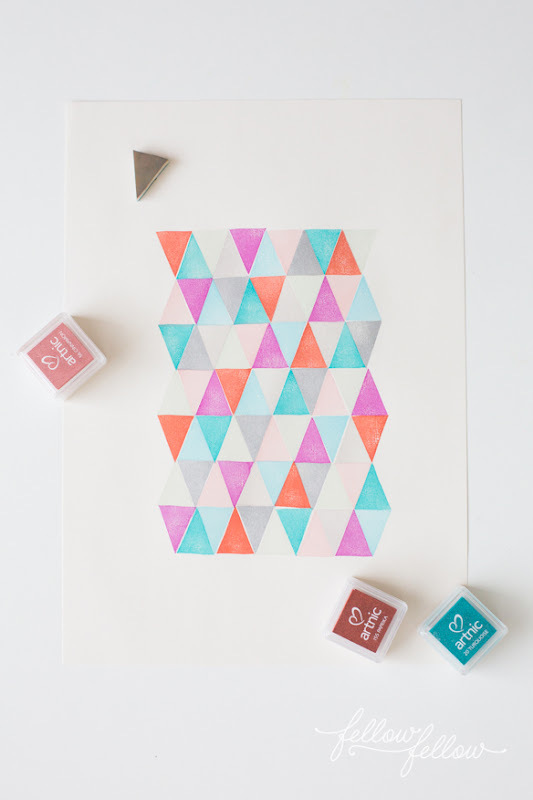 I've been making geometric 'art' using paint chips but stamps would be so much easier than hand-cutting the hundreds of triangles! Anonymous... the "blue rectangle with the suspenders"... perhaps a rabbit? What an awesome idea. I love it! This is a great imaginative idea. So simple yet so creative. Abstract geometric designs always look so wonderful. I also loved the village print. Thanks for sharing this. It is very inspiring and sure to make one want to give it a try. Cute... This will brighten up any dull wall!